Renaissance, as a direction of art, as a rule, glorified the past. With an eternal eye on the old masters, the new masters made the first uncertain tests of the brush, trying on the classicism and academism left by their predecessors. There was no talk of either Cubism or Modernism. Even impressionism was still far from inception. Taking the baton from those who were before them, the masters of the Renaissance and focused on the events of the past. To depict the modern period was unusual for them. Plots were mythological, religious, narrating about old feuds and old wars. If it was about modernity, then the artists’ brush was, as a rule, related to battle events, victories or defeats. This was considered to be a rather serious reason to paint the canvas with colors – emotions or a special vision of the world were not considered as such. The Battle of San Romano was written almost twenty years after the battle itself, which took place thirty kilometers from Florence between the Florentines and the army of Siena. Historically, the victory is attributed to the Florentines, but the chronicles of Siena suggest the opposite. The canvas depicts the course of the battle. People and horses mixed up, spears bristling, riders on gray horses thrown down. 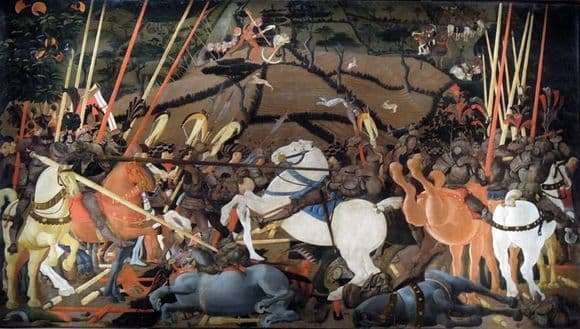 The picture shows the crucial moment of the battle, when the leaders of the army of Siena were crushed and thrown to the ground – it was their horses that lay on the sides in the foreground, and the horsemen of the enemies walk along them. Two armies collide. Screams, noise, clanging iron. In the picture there is nothing of the artist’s opinion – for such things it was too early, where sustainability of proportions and historical accuracy were considered more important. It is impossible to say what Uchchello himself thought about the war. He approved it or decried it, was afraid or, on the contrary, wanted to take part in it. Maximum impersonality – no opinion, except that style – is characteristic of the early Renaissance.